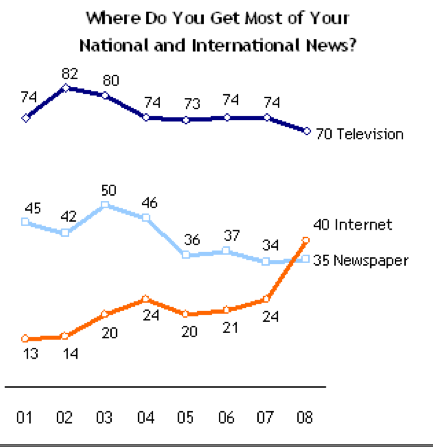 News Flash: More people get their news from the Net than from newspapers. While this will hardly count as news to most of our readers, the Pew Research Center seems surprised by the shift. In a survey of 1,489 adults in the U.S. conducted in early December, 40 percent said they get most of their national and international news from the Internet, compared to 35 percent from newspapers. The percentage of newspaper readers has been pretty steady since 2005. What’s changed is the number of people admitting they get their news from the Internet as well, up from 24 percent the last time the Pew Center asked this question in September, 2007. TV still beats both as a news source, with 70 percent, but give it a couple more years and the Internet should overtake that as well. Among younger adults, those under 30, the Internet already ties TV as a news source at 59 percent for both. (Last year, TV beat the Internet among this age group, 68 percent to 34 percent, to give you a sense of how fast things can switch). Have people’s reading habits really changed so much in just a year, or are Pew surveys a lagging indicator of reality? And if the numbers are accurate, is this just another nail in the coffin of newspapers? Not exactly. What isn’t clear from the survey is how much of that Internet news comes from Websites run by newspapers. The New York Times alone, for instance, operates the 16th most popular set of properties on the Web, although that does not seem to be helping much in the online advertising department. Even if newspapers grab a large share of the Internet news pie, that pie is just not as filling as a pie filled with more lucrative print ads. But as long as newspapers keep producing journalism worth reading (and adjust their business models accordingly), people will keep going to them for a portion of their news. It is just that they will read their news in their browsers instead of on paper.